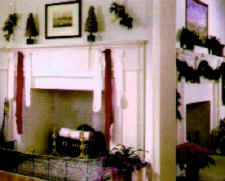 Has time robbed your chimney of venting efficiency, structural integrity and more importantly, safety? 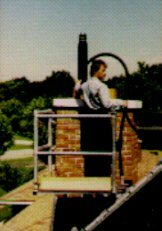 The Solid Flue restoration system involves pumping a highly insulative SOLID/FLUE mixture around a rubber form to "cast-on-site" the new chimney flue. The form is then removed, giving you a one-piece, seamless flue which not only strengthens the entire chimney, but improves efficiency and safety as well! SOLID/FLUE offers a full range of products and services to rectify all problems, both domestic and industrial. Inefficient, oversized or leaking flues, porous brickwork, downdraft and poor insulation are a few examples. 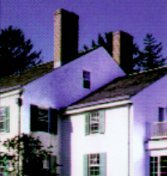 Exterior work is done only when necessary, preserving your chimney in historical condition by perfectly matching the original materials. 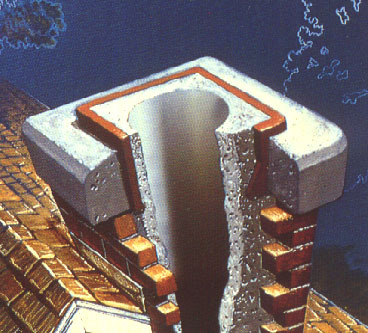 From the top of the chimney to the bottom of the firebox, SOLID/FLUE has you covered. SOLID/FLUE has been tested and is approved to allow the installer to line both the chimney as well as the firebox. This assures the property owner of protection even in instances where combustibles are in direct contact to the brick or other masonry materials. These "zero clearance" approvals (tested and listed by Warnock Hersey International, Inc. to UL 1777, ULC 5640M, and UL 127) allow SOLID/FLUE to give new life to unused chimneys and fireplaces. Doing this helps to increase your property value and, in the case of bed and breakfasts, condos, and other rental properties, often translates into increased revenue for the owners. 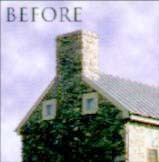 The patented "U.S." made" SOLID/FLUE formula contains Microsilica, a unique ingredient which reduces the products ability to absorb moisture. 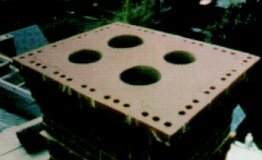 This makes SOLID/FLUE ideal for use in gas and oil venting applications where moisture often destroys other metal and masonry chimneys. When installations involve both a solid fuel (wood or coal) flue and furnace flue venting either gas or oil, SOLID/FLUE enables the installer to offer separate flues for each while assuring the homeowner of a chimney guaranteed to last the life of the structure. 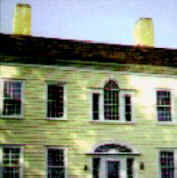 The Mayor of New York's "Gracie Mansion" circa 1803. 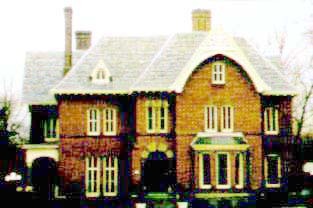 Frank Lloyd Wright's "Christie House" circa 1940, and "Seth Peterson Cottage", circa 1958. Bachelor Officer Quarters, Yellowstone National Park, circa 1895. 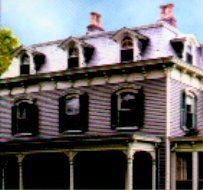 The "Watertown House", and the "Weatherbee Farm" for PBS's popular program, "This Old House".